As a small child, Kathleen proudly displayed her creative talents by drawing directly on walls and school desks. This instinct to draw grew along with her, so she earned an art degree and chose to be a self-employed artist. Now working (more appropriately) on canvas, Kathleen uses acrylic paint and oil pastel, layered with bouts of intense scribbling, to make her unique, happy paintings. If you look closely at the background of each piece, you will see drawings descended from the walls and school desks of her youth. 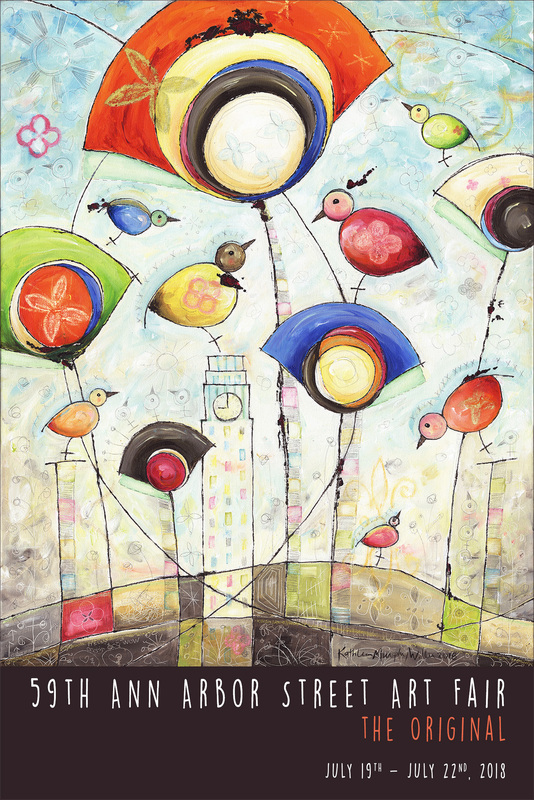 Kathleen has been painting professionally for 26 years and has collectors on five continents. She resides in Menomonee Falls, WI. To learn more about Kathleen, visit http://www.kathleenmurphywiller.com. The 2018 commerative poster will be available for purchase during the Art Fair in the Original's Store on N. University. You can also purchase here. The cost is $20 with a $7 shipping fee added. Posters are also available in our office. Please call 734-994-5260.